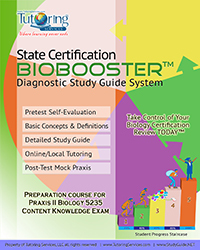 Educators aiming to teaching Biology in the United States are required to take certification tests such as the Praxis II Biology exam in order to become qualified as an official educator. The Praxis II Biology Exam is a specific test from the Praxis series wherein examinees are tested in different subject areas on content knowledge, content essays, and general science. Applicants should choose at first which part they want to begin with. Examinees can choose the type of test they prefer to take and also get registered for the exam either through internet or mail. The Praxis II Biology Exam assesses an educator’s knowledge and evaluates his/her competencies to determine whether the educator is qualified to teach Biology. The Praxis II series is mainly conducted for educators aiming for an entry-level teaching position as the certification is valid for teaching in the secondary level. To be eligible to take the Praxis II Biology Exam, applicants should hold a bachelor degree from any state or national university. Each state, however, has different passing criteria hence examinees should consider acing the particular subject where the state requires higher marks in. In the event that the examinee should fail to pass the exam, he/she is given the chance to retake the exam but only after a period of 30 days. 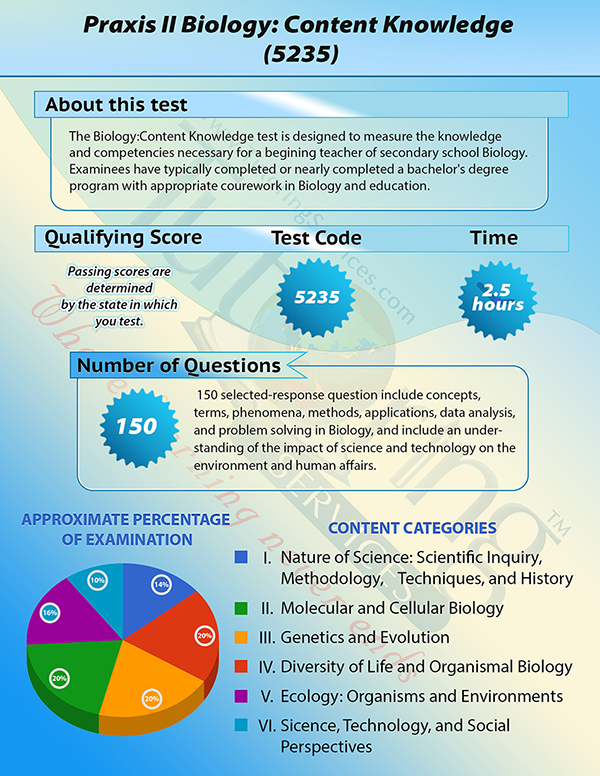 The Praxis II Biology Exam is composed of several different types of tests. The Praxis Biology and General Test consists of 120 multiple-choice questions and examinees are given 120 minutes to attempt the exam. 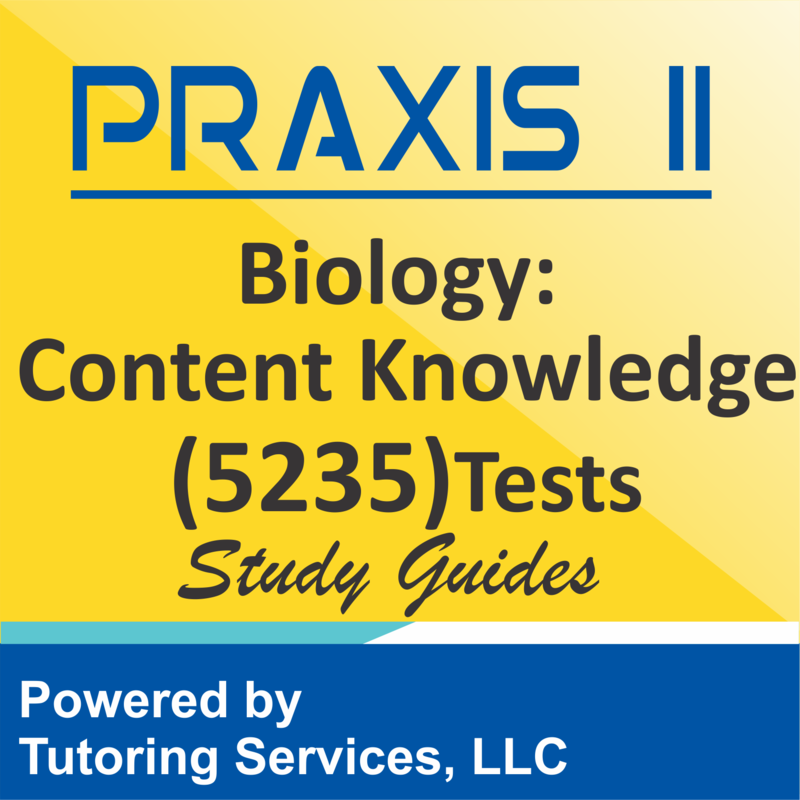 The Praxis Biology Exam (Content Knowledge) is divided into two subtests and both parts are made up of 75 multiple-choice questions with a time limit of 60 minutes per test. The Praxis II Biology Exam (Content Knowledge Advanced Level), on the other hand, includes 160 multiple-choice questions with a time limit of 120 minutes. 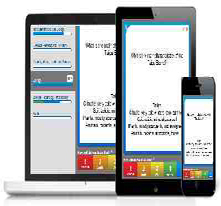 Questions on this test are more advanced and require a bigger knowledge base. 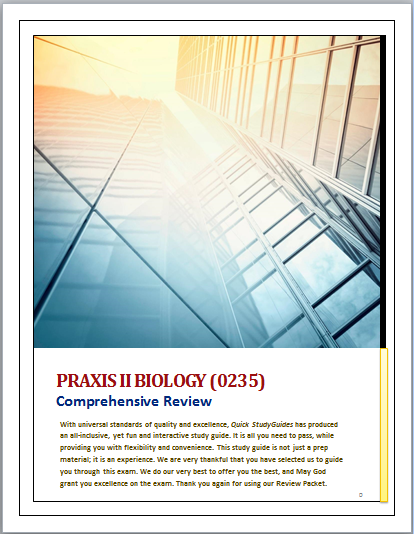 The Praxis II Biology Exam (Content Essays) is composed of three essay questions regarding the fundamental principles in Biology. Examinees are given 60 minutes to complete this test. Examinees should also remember that each constructive response query requires only 20 minutes to answer. Molecular Science – chemical basis of life, cellular function of life, molecular base of heredity. Diversity of life in animal and plants – anatomy and physiology of animals, plants. Genetics – classical genetics and evolution, inheritance, probability, phylogeny, environmental evidence. Evolution – evidence of evolution, mechanisms, populations, speciation. Ecology – population competition, communities, energy flow, biogeochemical cycle, human impacts, different types of eco systems. A study guide will definitely cover an examinee for topics he/she may have a hard time dealing with and with hard work and determination, it will be very easy to ace the exam. SELECT a.id, a.book_title, a.description, a.ad_image, a.image_tag, a.isbn, a.asking_price, a.book_condition, a.book_store_url, a.sg_type, a.url_path, c.subject_id, c.subject FROM tbl_used_book as a, tbl_booksubject_description as b, tbl_level_subjects as c WHERE a.exam_code = "biology-content-knowledge-5235-info" AND a.subject_id = b.subject_id AND a.subject_id = c.subject_id AND a.is_available = "1"